Joshua W. Murfree, Jr., Ph.D – 100 Black Men of America, Inc.
Dr. Murfree was recently selected as the Chief Operations Officer for the Fulton-DeKalb Hospital Authority in Atlanta, Georgia. Murfree is excited about the new position and is looking forward to the challenges associated with the appointment and working closely with the current staff, the Board and the community partnerships. Dr. Murfree formerly served as the Director of Intercollegiate Athletics at Fort Valley State University for approximately 3 years. His plan was to build a comprehensive, competitive and self-sustained Athletics program where student-athletes were placed in the best position to learn, achieve, win and succeed! To learn, achieve, and succeed was summarized in being excellent and graduating from the University. 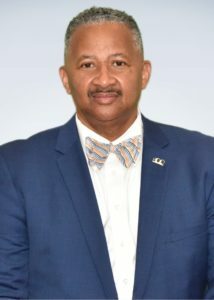 Dr. Murfree served as the 14th Superintendent of Schools in Albany, Georgia and in this role he did not waste any time outlining new directions for the system with the desire to improve community collaborative efforts and parental involvement that led to a reduction in dropouts and improvement in promotion and performance for students. He introduced the need for a Drop-In Academy, A Career and College Readiness Academy, as well as a technological savvy district. Murfree introduced an aggressive charge for mentoring programs across all schools for males in the district and supported the current charter schools. Dr. Murfree’s introduced a plan to open a Virtual School for the district to assist with Home Schooled children and their families. Dr. Murfree started a Pre-K to college program which is still in existence today. Murfree was able to acquire $1,000,000.00 in scholarships from Florida A&M University for deserving students in the STEM areas. Dr. Murfree was recognized as a 2012 nominee for Superintendent of the Year by the Georgia School Superintendent’s Association. Under Dr. Murfree’s leadership the district received its reaffirmation for accreditation under SACS/AdvancED for another ten years. He and his team work diligently to receive both “Race to the Top and School Improvement funding for the District. Dr. Murfree oversaw an overall budget of approximately $280,000,000.00 when including facilities.